A city steeped in history and legend, Alexandria was founded by Alexander the Great in 332 BC. It overlooks the Mediterranean at the eastern edge of the Nile Delta and served as the capital for four different civilizations. As a center for Hellenistic culture and learning, it was the home of iconic ancient landmarks like the Great Library, the Necropolis and the Lighthouse of Alexandria. The latter was one of the Seven Wonders of the Ancient World. Today these buildings have disappeared but Alex remains an important industrial center and sea port. It is the second largest city in Egypt after Cairo and has plenty to tempt visitors and locals alike. After its foundation, Alexandria grew rapidly so that a mere century later, it was the largest city in the world and second only to Rome in importance. It attracted artists and scholars from all over the Mediterranean and was home to significant Greek and Jewish communities. During Roman times, the Patriarchate of Alexandria was one of the most important centers of early Christianity and the city served as the capital of Egypt for over 1,000 years. Alex lost its capital status during the Muslim conquest of 642 AD but remained an important maritime and trade base until the 15th century. The 16th century brought epidemic disease to the city and a period of administrative neglect led to rapid decline. By the time the French invaded Egypt at the end of the 18th century, there was little left of Alexandria's former grandeur. The following century saw a revival in the city's fortunes thanks to the booming cotton industry, however, and today it is key to the Egyptian economy once again. Those with an interest in the city's history should start their tour at the Alexandria National Museum. Housed in Italianate Al-Saad Bassili Pasha Palace, the museum guides visitors through the Ancient Egyptian, Greco-Roman, Coptic and Islamic eras with a series of fascinating artifacts spread out across three floors. These include Roman statuary and collections of antique coins and jewelry. Alexandria's legendary Great Library may have long since been destroyed, but this modern reinterpretation is a worthy successor. In addition to the library itself, the building hosts four museums, a planetarium and regular art exhibitions, workshops and events. Of particular interest is the Antiquities Museum. Here visitors can see Hellenistic, Roman and Byzantine artifacts discovered during the excavation of the museum site. 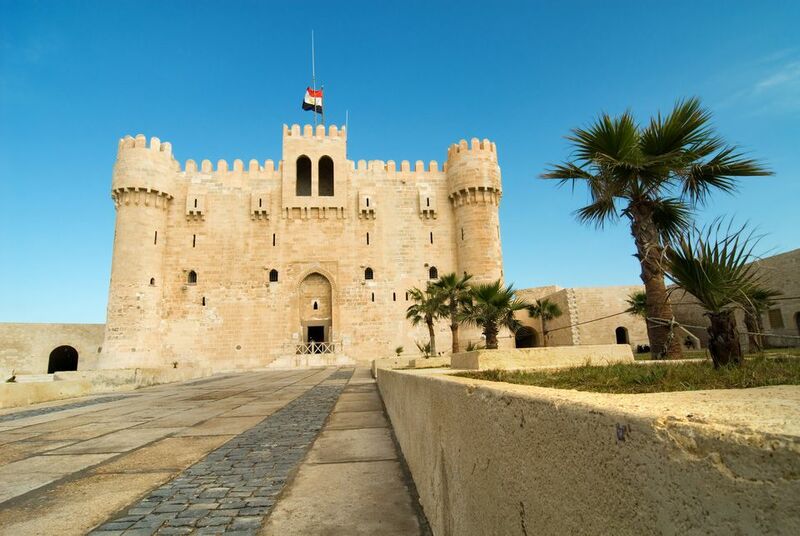 This impressive fortress is located at the end of the narrow peninsula from which the Lighthouse of Alexandria once protected the Eastern Harbor. The rubble of the original lighthouse was incorporated into the fortress during its construction in the 15th century. Today it houses a naval museum and visitors can explore its labyrinthine rooms and towers before admiring impressive views of the harbor from its ramparts. The Corniche is a scenic promenade that runs the length of the Eastern Harbor. It encapsulates the essence of the modern city and you'll find tourists and locals taking in the sea view, sampling fresh seafood at waterfront restaurants and photographing the road's fading 19th and early 20th-century architecture. Of particular interest is the Cecil Hotel, which hosted Winston Churchill and the British Secret Service during WWII. When builders began laying the foundations for an apartment block on this site, known at the "Mound of Rubble", they had no idea what they would find beneath. Now, the remains of the only Roman amphitheater in Egypt are open to the public, along with the 2nd-century Villa of the Birds. The latter is famous for a remarkably intact floor mosaic complete with beautifully rendered peacocks, pigeons and parrots. Alexandria has hotels to suit every budget. For 5-star luxury, opt for the Four Seasons or Helnan Palestine. The former is the top-rated hotel on TripAdvisor and offers a resort-style waterfront setting with opulent seaview rooms and suites. The latter is located next to tranquil Montaza Park and boasts a beach spa, swimming pool and several global restaurants. 4-star Steigenberger Cecil Hotel is a great choice for history enthusiasts. It sits directly on the Corniche and has hosted the likes of Agatha Christie, Henry Moore and Al Capone. Travelers on a tighter budget will find clean, comfortable accommodation at Alexander the Great Hotel. Located within walking distance of the Cavafy Museum and Kom el-Dikka, it has 29 air-conditioned bedrooms all with private bathrooms and satellite TV. Greek, Italian, Lebanese, American and Japanese restaurants sit shoulder-to-shoulder in cosmopolitan Alex. For an authentic Egyptian experience, head to Balbaa Village, where fresh seafood is cooked to order on open grills. Expect to eat with your fingers at noisy tables crowded with people. Upscale restaurant Sea Gull serves fine seafood and Mediterranean classics in a more refined setting, while Byblos is a favorite option for gourmet Lebanese cuisine. If you have a sweet tooth, don't miss Delices, an old tea room and patisserie loved for its pastries since 1922. Many visitors choose to fly into Borg El Arab International Airport (HBE), which is located 25 miles southwest of Alexandria city center. It's possible to catch a connecting flight from Cairo, the main Red Sea resort towns and various locations across the Middle East, Greece and Turkey. Upon arrival at the airport, the only way to reach downtown Alex is via taxi. Several bus companies (including West & Mid Delta Bus Company and Superjet) travel to Alexandria from other destinations in Egypt. From Cairo, buses depart to Alexandria virtually every hour up until midnight. It's also possible to catch a train from the capital's long-distance Ramses Station. Once you get to Alex, use taxis, trams, buses or Uber to get around.